Enter the Grand Canyon of the Pacific. Hike through a native forest into the island’s volcanic interior to encounter an ecological wonder and a geological past. 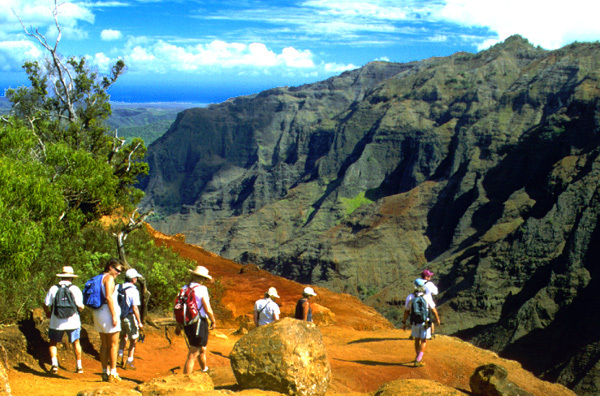 The Waimea Canyon Explorer is a Kauai Hike you will never forget. Here, you will behold what the first people to these islands saw in the upland native forests of Kokee – tall Ohia trees twisting through mists into the sky, adorned with their lacy scarlet lehua blossoms – forests of Koa trees, with their sickle-shaped leaf-stem phyllodes dangling from branch tips. Half way along your hike you will emerge at Waimea Canyon’s rim to stunning iron-rich, red cliffs that plunge 2,500 feet to where the Waimea River winds its way to the sea along a 12-mile long chasm. You will be gazing into the guts of a Hawaiian shield volcano. Your naturalist guide explains it all to you – the geology of Kauai, the plate tectonic history of the entire Hawaiian archipelago, botanical history, cultural sites, Hawaiian myths and more. Dine al fresco at a secluded spot with a panorama on one hand of the Alakai Swamp – a flat, mountain-top bog – and on the other, a postcard-picture-perfect Waimea Canyon view all the way to the sea. The 5-mile loop trail loses and then regains 400-500 feet of elevation as it goes down through cloud forests to the canyon rim before returning you to your starting point. You will gain an appreciation for the mantra of canyon hiking — what goes down, must come up. We provide a healthy picnic lunch, bottled water, snacks, and fruit. Day-packs are provided if needed to carry your lunch, water and personal items. This tour leaves the Poipu area at 8:00 to 9:00am, depending on logistics, and returns by 4:00 to 5:00pm. Transportation to and from the trail head is one hour each way. This excursion is rated as only moderately strenuous. Sturdy walking/hiking footwear is recommended.